How much does it cost to travel to Mykonos? How much money will you need in Mykonos? 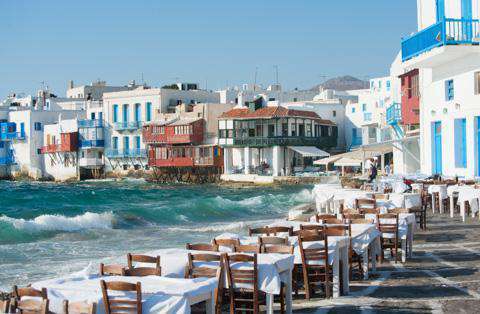 €101 ($114) is the average daily price for traveling in Mykonos. The average price of food for one day is €36 ($41). The average price of a hotel for a couple is €97 ($110). Additional pricing is in the table below. These average travel prices have been collected from other travelers to help you plan your own travel budget. How much money do I need for Mykonos? Mykonos, a Greek Island in the middle of the Aegean Sea, is part of the Cyclades group. Mykonos is one of the most touristy islands in the Aegean Sea and is famous for its whitewashed buildings that climb up the hill. Mykonos, along with Santorini, is also one of the most expensive Greek Islands. Because of its popularity, Mykonos comes with a hefty tourist markup. Cruise ships also frequent the island so during the day its small streets can become overrun with tourists and its harbor fills with large ships. August and July are the most popular times to visit, so if you're hoping to avoid to crowds it's best to come a few months earlier. Mykonos' climate is hot and dry with mild winters. Summer is very dry and rain is more common between October and April. Temperatures in July and August hover around 30 degrees Celsius during the day and drop to 22 degrees during the nighttime. There's a constant wind during the months of July and August, which can provide a little relief from the heat. Beaches are best visited between the months of May and October. Mykonos Town has many interesting sights and attractions. Panagia Paraportiani is the most impressive church. Little Venice is an area that sits beautifully by the sea and the medieval two and three storey houses are known for their colorful, wooden balconies. This is one of the most scenic parts of Mykonos and is a great place to watch the sunset. Also don't miss the windmills. These windmills date back to the 16th century and are a popular landmark of the island. Museums of interest include the Archaeological Museum of Mykonos, the Folklore Museum, Lena's House Museum, the Aegean Maritime Museum, the Agricultural Museum, and the Boni Mill. The island's most popular beaches are on the south side and include Psarou, Platys Gialos, Paranga, Agrari, Paradise, and Elia. The island's most popular towns are Chora (Mykonos Town) and Ano Mera. Mykonos Town is stunningly beautiful with a maze of tiny streets and whitewashed lanes. There are houses and churches gathered around its harbour in the middle of a wide bay. Ano Mera is a small village that is in the middle of the island. It's about seven kilometers from Mykonos Town and is the only inland community on the island. There is a large central square that is surrounded by Greek tavernas and the main sight is the monastery of Panagia Tourliani. Other small towns on Mykonos include Agios Ioannis, Agios Stefanos, Platys Gialos, Ornos and Tourlos. You can easily find British and American breakfasts, loud clubs, and travelers out to have a great time. Despite being a small town, Mykonos is known for its nightlife. Other interesting activities around the island include glass bottom boat tours, sailing tours, and daily excursions to the small, uninhabited island of Delos. Most of the island's restaurants are found in Mykonos Town. They are diverse and cater to a range of tastes and budgets. There are many different gyro and souvlaki shops as well as creperies that are pretty good and reasonably priced. Traditional Greek food can range in price from quite cheap to incredibly expensive, depending on the restaurant you choose. You can find the menus and prices for most restaurants outside of the main entrance. It's possible to spend a great deal of time walking around and searching for the perfect restaurant. Those restaurants that are near the water, have views, or are around the harbour tend to be the most expensive. You're not only paying for the food, but also the location. If you're looking for a good priced, but delicious meal, head into the center of town and find a smaller, off the beaten path restaurant. It is possible to travel around the island by bus. The system is decent, but not great, so if you're on a tight schedule it is better not to rely completely on the system. You can purchase your tickets on the bus itself, from the driver, but you will be required to have exact change. Taxis are also not your best option, as the entire island is served by no more than thirty taxis. This means your waits can be long and the rides are often expensive. If you want to go to a less popular area, or a beach not served by public transit, your best option is to rent either a car or motorbike. You'll find plenty of car rental companies around the island and driving is generally easy and smooth. If you're flying into Mykonos ask your hotel if they offer a pickup. Sometimes the pickups are free, but often they can be more expensive than a taxi. If you're booking your room directly with the hotel, ask when you make your reservation. This is the time you're most likely to be offered a free pickup. If you don't get a ride from your hotel you can pick up a taxi at the airport. There's a taxi waiting area across from the terminal building. A ride to town should cost you about eight euros, and slightly more if you have big bags. There's also a bus option during peak season. It's infrequent and will drop you off at the southern bus station, Fabrika in Mykonos Town. The ride is 1.60 euros. You can also catch a ride from town to the airport, but check the schedule ahead of time as it changes frequently.